How to become a concrete contractor, before you enter the concrete business, bear in mind that the competition is stiff, therefore be ready to work really hard to make it big. Once you are mentally ready for this intensive business, you can initially penetrate the market working on small residential projects and even multi-level commercial jobs. Your first year of operation would be the hardest, but by producing work to the customers’ satisfaction, you can ensure the success of your concrete company. How to Become a Concrete Contractor in California? To become a concrete contractor, you will need at least a bachelor’s degree or equivalent in civil engineering or a related field. After that, you will need to obtain a license, which is a requirement in every state. No matter how learned you are on the topic in terms of theory, you will still need to gather a sufficient amount of experience. The industry you are dealing with is vast, and will require an understanding of a lot of difficult concepts and procedures. For this purpose, you are advised to get firsthand experience, both on the field and in terms of office work. This will allow you to work directly with materials, suppliers, homeowners and contractors. You’ll need to know your target market. You may want to focus on commercial projects such as offices, schools and public works, or you can go for residential work that would involve pouring walkways and patios in people’s yards, etc. Concrete companies that work on both residential and commercial projects are very few, since the tools, skills and expertise required for both vary a great deal. Decide at the start which sector you want to work in. You need to have a business plan in place before anything. You will need to know the direction of your business, your goals, and strategies and so on. Even if you can finance the business on your own, having a proper plan will help you remain focused on the important matters at hand. Within this document, add your target market segments, your company’s mission and philosophy and your projected financial data. You can revise the plan semi-annually to keep it updated. This would be particularly important if you are planning to work in the commercial field. For work in this area, you will need to get your hands on heavy duty mixers, vehicles and other required professional quality tools. This is one of the first things you should take care of when you plan on starting a business. Get in touch with a lawyer and discuss your options. You can consider forming an LLC or a corporation in order to make sure your personal assets are protected. You will also need to obtain liability, company auto insurance and worker’s compensation insurance. As soon as you initiate the planning phase of your concrete business, you will need to start looking for trustworthy suppliers. It is common for certified concrete contractors to arrange for a supplier who provides them with pre-mixed concrete. There are a lot of concerns you will need to keep in mind in terms of the supply chain, including scheduling of orders, drying of the concrete, the weather, etc. To get into the commercial world, you have to start somewhere. You are recommended to start with the Blue Book’s BB Bid System. This is a free book service that lists every contractor in the US according to region. You can get a hand on a copy of this book in any contractor’s office. This helps you list your company for free. Contractors will then begin inviting you to place bids on projects as soon as you are listed. In addition to that, you are advised to meet with local contractors and request your company to be added to their bid list. And as far as the residential work projects go, you should ask any one you know to spread the word about your business and help you grow. Once you have taken care of all of these matters, you can begin your business activities as a certified concrete contractors. Are you interested in becoming a licensed plumber in the state of California? Do you know what the requirements are? If this is a career path you’re serious about pursuing, read on to learn more. Plumbers are professional trades-persons who deal with the installation and repair of pipes and fittings. In particular, pipes and fittings which carry water or gas, as well as for heating and sanitation systems. Plumbers carry out their work in homes, offices, and factories. Licensing is a very important aspect of becoming a plumber. This is because once a plumber is licensed they are certified as having the requisite knowledge, expertise, and experience to carry out their work according to recognized plumbing standards. Licensed plumbers are awarded a compliance certificate which can be shown to their employers. This certificate testifies that a plumber is meeting all relevant plumbing codes, standards, and regulations on the job. They also have insurance which is intended to help their customers in the event that the plumbing work was faulty. Plumbers that are not licensed may be penalized for carrying out plumbing work without a license. Because plumbing is a trade profession, individuals who wish to become plumbers must meet certain requirements. Plumbing technology programs are designed to teach students about the fundamentals of plumbing. These courses are typically offered at community colleges or vocational schools and last for two years. Alternatively, candidates may also enroll in a plumbing apprenticeship. Apprenticeships are offered by plumbing unions and business and can last anywhere from 2 to 3 years. These programs include both practical experience components, which are often paid training opportunities with licensed plumbers, and formal classes. In order to sit for a plumbing exam, prospective plumbers must have met certain education and experience requirements. The California Plumbing License Exam is needed in order to work as a licensed contractor in California. Any individual who intends to work as a plumbing contractor that is responsible for constructing, altering, or repairing a building or structure needs to be licensed. This is especially so if the total cost of the job is or exceeds $500. The California Contractors State Licensing Board (CSLB) is the authority that regulates plumbing contractors. How do you get a license? In order to get a plumbing license, candidates must appear for two exams. The first exam relates to trade knowledge in the field of plumbing. The second one covers aspects of law and business related to plumbing. Some study material can be helpful like C36 License Study Guide for exam preparation. How do you qualify for the exam? The California Contractors State Licensing Board (CSLB) requires licensed plumbers to renew their license every two years. You will not be expected to satisfy any additional education requirements at the time of renewal. After reviewing all of this information, you can decide whether or not you want to give the exam. The California Contractors State Licensing Board (CSLB) offers up to date information about the license application process as well as useful study materials that can help you pass the exam. If becoming a plumber is something you really want to do, you’ll need to go through the process of licensure in California. The C-7 Contractor’s License is required by installers and technicians etc. who are involved in the process of installing, servicing or maintaining all types of low voltage systems. This license does not allow the licensee to work on low voltage fire alarm systems, fire protection equipment, lock and security equipment and solar equipment. How to Get Low Voltage License? Low Voltage contractors need a license to practice. For this, they have to follow a certain procedure, pay fees and provide several documents to complete an application and verification process. The licensing requirements vary from state to state. If you need state-specific details, you can check the National Electrical Contractors Association website that lists in detail requirements for each state. The following contains requirements for the C7 Low Voltage Contractors License in California. If you are getting licensed for the first time, you will need to take both the law and trade exams, along with the actual contractor’s exam. The actual contractor’s exam has 100-120 questions, with a time limit of 2-1/2 hours (around 150 minutes). You will require pre-approval from the state to sit for the examination. In addition, bear in mind that you will need at least 70% marks to pass the exam. The content for a C-7 Low Voltage Contractors License Exam includes a number of topics relating to the various aspects of low voltage equipment, their installation, and maintenance and servicing. You will be exposed to topics such as job design and planning, material selections and estimation, wire/cable installation and termination, component installation, testing, troubleshooting, repairing and safety while installing. There are several organizations that provide detailed study guides to help applicants prepare for this exam. Even if you are reapplying for a second or third time and have “mastered” the exam content, you’d still be better off preparing for the exam. This is necessary since requirements keep on changing. In addition, low voltage equipment also frequently gets updated. The first thing you need to do is get your hands on the right kind of study materials. Ideally, you should cover major topics such as basic electrical theory, plan and circuit symbols, electrical materials, low voltage relay circuit, first aid, satellite antenna systems, optic fiber and computer networking processes. You might also want to cover some aspects of the health and safety orders that would be relevant to the low voltage exam and subsequent practice in the field. To apply for a license, a certain amount of money needs to be paid for processing fees and application charges. The State of California has an initial application fee of $330 for new applicants. The fee amount is the same for contractors who are reapplying for licensure. There is an additional fee ($200) for a two-year license card. Following the approval of your application by the Contractors State License Board, you will be notified regarding your test date and further test-related details. In addition to these, further financial requirements need you to have at least $2,500 in working capital (this can be in cash form or equipment that will need to be verified). Along with these requirements, applicants are also required to file a bond with the Registrar in the amount of $15,000. Once you have successfully passed the examination, you will receive a wall certificate and a pocket license, certifying that you are a licensed C-7 contractor. If you have any other queries regarding the license, its requirements, exam, fee structure or application process, following is the address to get in touch with the California State Licensing Board. Note: All relevant information and guidelines are provided in great detail on the website. You will find Application for Original Contractor License in PDF – this will guide you through the application process. 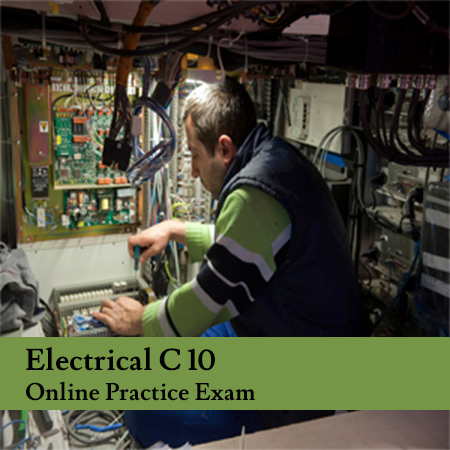 Why do you need a C10 Electrical Contractor License in California? If you want to work as an electrical contractor in California on any project that is valued at $500 or more, you will be required to obtain a C-10 electrical contractor license from the California Contractors State License Board (CSLB). If you contract without a license, you can be held legally answerable for it and might even end up with a potential sentence of six months in jail. How Can You Get C10 Electrical Contractor License in California? You must have at least four years of on-the job experience at a journeyman level or higher. In addition, you must also pass two tests – a law and business test and an electrical contractor test. Only on successful completion of these two examinations can you be issued a license. You must complete a California electrical apprenticeship program. These programs combine classroom instruction with hands-on training and take at least four years to complete. In addition, you must also take and pass a certification exam to get your Certificate of Completion of Apprenticeship. You will need to include this Certificate in your C10 license application. You will need to get employed as an electrical journeyman and complete one year of work in this position. Till this step, if you have completed an apprenticeship program, you will be given three years of credit and you will not have to put in the four-year general requirement. Get an online copy of the Original Contractor’s License packet from the official CSLB website. Go through this pack and make yourself familiar with the basics of the licensing procedure. Submit a Certificate of Work Experience from any employer under whom you have previously worked as an electrical journeyman. For applicants who have completed the apprenticeship program, you will only need to provide one year of such experience. Complete the application and give it in for final processing and submission. Make sure you have provided all the supplementary documents and relevant fees and clearly mentioned the indicated address. When and if your application gets approved, you will receive a Notice to Appear for Examination and a request for your fingerprints. Guidelines will be provided on how to arrange your fingers to send an electronic copy of your prints to CSLB from your local Live Scan facility. The receipt you get from here will have to be submitted to the CSLB. Make sure you submit this receipt no later than 90 days after receiving your fingerprints request. Once you have followed the above, you will be allowed to sit for the two required exams at the date and time you are provided with in your exam notice. In case of a failure to appear for the exam at the given date and time, you may be allowed to reschedule for a certain fee. Your test results will be available to you before you leave the testing site. Once you have completed the exam, you will be given instructions to submit a surety bond along with a proof of workers’ compensation insurance and a licensing fee. Get a surety bond in the amount of $15,000 and submit the original bond to the CSLB within 90 days of the bond’s effective date. After this, get workers’ compensation insurance from any licensed insurance agency in California. Submit a copy of this to the CSLB. After you have completed the above and submitted your licensing fee to the CSLB, you will be issued a license. In addition, you will also get a wall certificate and a permanent wallet-size pocket license. You will be required to display the wall certificate in your office at all times. A Law and Business Contractors license by the California Contractors State License Board (CSLB) is required to perform work on a majority of construction projects in California. In California, all individuals and businesses that construct or alter, or offer to construct or alter, any construction project except federal projects has to be licensed by the CSLB. This is especially true when the entire cost of materials and labor is $500 or more. An individual, who wishes to be qualified for this license, must possess at least 4 years of experience at the journey level, within the ten years before the application for the license. Candidates will only be given credit for experience as a foreman, journeyman, contractor, supervising employee or owner-builder. In addition, all relevant experience will have to be verified by a qualified individual who has first-hand knowledge of the individual’s work during the relevant time frame. Up to 1.5 years of credit can be attained upon submitting of transcripts relating to an Associate of Arts degree from an accredited college. The degree needs to be in building or construction management. Up to 2 years of credit can be received if transcripts for a (i) 4-year program from an institution that is accredited, are submitted in the fields of business, accounting, physics, economics, mathematics or a related field, (ii) a professional degree in law, (iii) a significant amount of university-level work in subject areas of accounting, business, architecture, drafting, construction technology, mathematics, engineering, economics or physics. Up to 3 years of credit can be attained if any of the following are submitted: (i) a Certificate of Completion of Apprenticeship from an accredited program or a certified document that signifies the completion of apprenticeship training from a union in the classification being applied for; (ii) official academic records for a four-year degree from an accredited college in any field, such as architecture, engineering, construction technology or others that are directly relevant to the classification being applied for; (iii) transcripts of a four-year degree from an accredited university in the subject areas of horticulture, if applying for a Landscaping classification. Class “A” – General Engineering Contractor: The main business for such a contractor is related to fixed works that require specialized engineering know-how. Class “B” – General Building Contractor – The main business for such a contractor is related to any structure constructed, in the course of being constructed, or set to be constructed at a time in the future, requiring in its building procedure the use of at least two distinct building trades or crafts. Carpentry and framing projects can be performed without constraint. Class “B” contractors also have the option of entering into direct contracts for projects that involve only one trade, given that the contractor holds the relevant specialty license. Class “C” – Specialty Contractor: For this classification, there are 42 separate options for contractors, whose foremost business involves the application of specific building trades or crafts. In the options above where you are required to give an exam, you must submit the relevant application, along with a processing fee of $330 (the amount being charged currently) to the CSLB. In cases where you do not need to give the examination, you ought to submit the relevant application with a processing fee of $300 (the amount being charged currently), along with a preliminary licensing fee (currently $200) and an additional classification fee of $75 (the amount being charged currently). Note: The applications need to be submitted in person or through mail to the CSLB. Even though the CSLB has different offices, the office in Sacramento is the only one that accepts the applications. The address for this office is: P.O. Box 26000, Sacramento, CA 95826. If you are giving the examination, there are certain requirements you will need to. You will be required to pass a written law and business exam for it you have to prepare Business Law Practice Exam and a specific trade exam. You will be allotted 3.5 hours for each exam, which would always be in a multiple-choice format. The centers for exams are typically located in Fresno, Oakland, Sacramento, San Bernardino, Norwalk, Oxnard, San Jose and San Diego. The details for your exam venue and date, along with a study guide, will be sent to you by the CSLB. If the individual is the immediate family of a person who is already licensed, and has had a good reputation for five out of the past seven years, prior to the application procedure. The qualifying individual must be deeply involved in the licensee’s business for five out of the past seven years and is applying for the same classification, and the license is mandatory to go on with the operation of an existing family business due to the absence or death of the licensee. Note: In cases where you think that you might be entitled for an examination waiver, you will still be required to fulfill the “Experience” section of the application. This is, unless you are a current qualifier on a license in good standing in the same class, as the license you are now applying for. Liability Insurance: Proof of liability insurance, with a cumulative limit of $1 million for licensees who have five or lesser employees, and an added $100,000 for each additional employee. However, the amount must not exceed a total of $5 million. Valid licenses expire every two years, while inactive licenses will expire every four years. Keeping this in mind, you should know the expiration date of your license and renew well in time. Note: In case if you do not receive the renewal application, you can order one online or simply call the CSLB at 1-800-321-CSLB (2752). You have to send your renewal application to the CSLB before the expiry date is passed, in order to avoid any unlicensed time. The responsibility of following through with the renewal process lies with you, and not with the Board, even if you do not receive the form. Bear in mind that the processing time can vary significantly, therefore you should submit the renewal form in a timely manner. The renewal fees would vary according to the time-frame in which you renew. The delinquent fee option comes into play if an acceptable renewal is not received on or before the date of expiry. If the nature of the business entity in question has changed (for instance, from a sole proprietorship to partnership, corporation etc), you will not be able to renew the license. Note: You can renew a suspended or expired license as well. If your application for licensure is approved, you will receive a Letter of Acknowledgement from the CSLB. This will contain a nine-digit Application Fee Number and a four-digit Personal Identification Number. You can use these to track your application on the CSLB website. The application processing can take up to 3-4 months, therefore wait patiently. You may contact the CSLB if you have any other concerns.